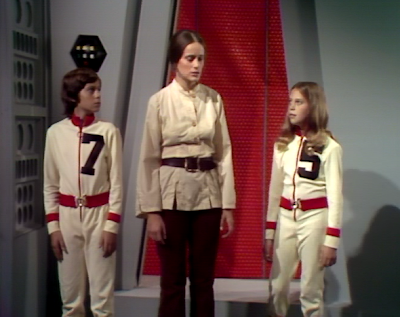 This week’s episode of The Starlost, “Children of Methuselah” is one that seems very familiar in terms of sci-fi TV tropes. The idea of a society of wayward children -- with no adults present to temper them -- likely goes back to the William Golding novel Lord of the Flies (1954) and has been featured on Star Trek (1966 – 1969) in “Miri” and on The Fantastic Journey’s (1977) “Children of the Gods” to name only two examples. The notion underlying the trope is that, without the aid of parents and mature adults, societies of exclusively young folk lack critical qualities like experience, wisdom and even empathy. Usually, when this trope is featured on TV, outsiders arrive and provide leadership by example for the children. 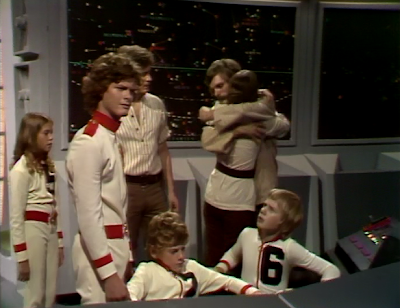 In “Children of Methuselah,” Devon (Ker Dullea), Rachel (Gay Rowan) and Garth (Robin Ward) discover a chamber they at first presume to be the Ark’s back-up bridge, which they have been seeking since “The Goddess Calabra.” The bridge, however, is guarded by a group of apparently immortal children. Hundreds of years earlier, these children were deliberately injected with a serum that instantly regenerates their cells. They also possess a serum to restore “natural aging” once the ship’s crew returns. Meanwhile the children, led by Captain One (David Tyrell) have been training on the bridge’s controls for hundreds of years. As Rachel soon learns, all of the children seem to be suffering from a lack of play and freedom in their lives. They no neither “innocence” nor “joy,” and Rachel attempts to rectify this by giving the children real names, not numbers, and by teaching them how to play Blind Man’s Bluff. At first, the children are resistant to this new information, but soon two children, Sarah and David, come to trust Rachel. With Rachel’s help, Devon escapes from custody and proves to Captain One that his culture of children is built on an error. Their dome is not the back-up bridge at all, but a training center, and all the controls are simulations used for instruction. The trio from Cypress Corners has found, essentially, the Ark’s school, only with the students left in charge…for centuries. In “Children of Methuselah,” the wayward children are gifted with incredible telepathic powers and can “think pain,” a skill which makes them formidable foes. And a central portion of the episode concerns a court-room trial of Devon and his friends, but it is the very definition of a kangaroo court. In both cases, the threat doesn’t seem particularly overt, and yet the story is an interesting one, seeing how it involves, primarily, perception and assumption. The finest aspects of “Children of Methuselah” involve Rachel, who is rapidly becoming the most likable and human of the series’ main characters. After Rachel becomes a ward of the dome, she is sent to a play center, where relaxing children experience visual hallucinations through a head-set that very much resembles 1990s virtual reality machines. In these sequences, and in the naming of the children, Rachel proves a likable and sympathetic person. Where Devon has become a very single-focus character, understandably, Rachel is able to show a softer, more human side. Not so successful, perhaps, is the through-line here involving One and his attempts to hold power over the society of children. It’s not clear why he is so resistant to Devon’s pleas to check and confirm his story of a collision course, and so One’s resistance seems the product of stubborn pride more than anything else. This may be intentional -- a commentary on the fact that children are not so different from adults -- but it plays as a cheap plot mechanism nonetheless. Captain One isn’t evil or misguided; he’s just doing what he believes he must do to survive. But there would be no conflict (and no fifty minute episode…) if he allowed himself to test Devon’s theory, I suppose, and so he resists, right through the last minute, independent verification. I don’t know if The Starlost is breaking down my resistance an episode at a time, or what, but I found “Children of Methuselah” to be a pretty decent outing for this Canadian science fiction series. It certainly moves faster than next week’s installment, “And Only Man is Vile,” which I’ve started to watch three times…and fallen asleep during, three times. 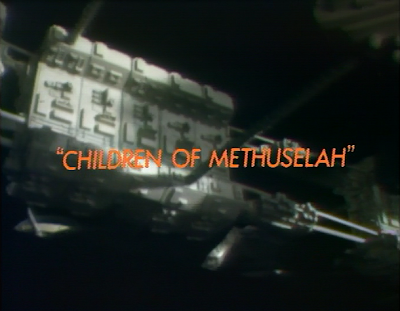 John, good review of Starlost "Children of Methuselah" episode. It's been well documented that the writers basically ignored Harlan Ellison's original concept and went in their own directions, but I found it particularly disappointing that they didn't even try to establish any internal logic of their own. In the case of this episode, if the people who built the ark had a serum that could keep people immortal (for a long period of time anyway), why didn't they give that to the crew who would actually pilot the ship? Maybe I'm experiencing the same drowsy effects you are, but I can't get a handle on the working structure their forefathers laid out. In an earlier episode, we see people stored in cryogenic chambers, which I assumed were people put on deep freeze until they reach their destination, but they only revive one guy and he has a fatal disease. Then we find out that there were people who flew missions to acquire supplies, but they clearly know nothing of an immortality serum. It's pretty obvious that they were making up new stuff as they went along, and that would've been fine if Devon and the gang only traveled to the bio-domes where each society would have its own internal logic. Instead, they spend most of their time dealing with the inner workings of the ark, but nothing adds up. I won't get ahead of your reviews by mentioning future episodes, but this inconsistency continues. There's many examples of child society, from the ones you've mentioned to, aguably, the feral children in the movie version of Logan's Run. It would be interesting to see you expand on this by perhaps reviewing series like 'The Tribe', or 'The Odyssey'.